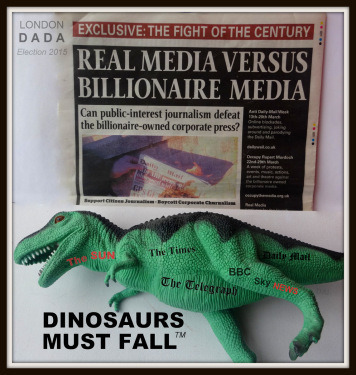 * The slogan, Dinosaurs Must Fall* – relating to the pre-election battle between vested interest hard copy, TV & radio mainstream media ..and free range social media ( in which – as time & tech progress and a new generation becomes embedded in the population – there can only be one eventual outcome) *coined by artist Michael St.Mark, March 2015. * Update 11th May. Despite the election result falling on the side of the string-pulling establishment again this time, the trend towards social media usurping the static, one-dimensional ( the Murdoch-dimension ) mainstream as the de facto source for news and CAs will inexorably increase along with its free range of opinion and info choice – therefore produce outcomes that reflect a better-informed electorate. – Hugo Ball, father of Dada. Mounted on candy white artists card within a 9″ sq passe-partout box frame. *Comment on the increasingly desperate daily election pledges from political parties in the run-up to the UK 2015 general election. Photomontage with ink and graphite. After Salvador Dali‘s Lobster Telephone. London Dada’s entry for this year’s DaliKrab Day; an annual online free range creative art and music fest hosted by Stateside artist Justynn Tyme. 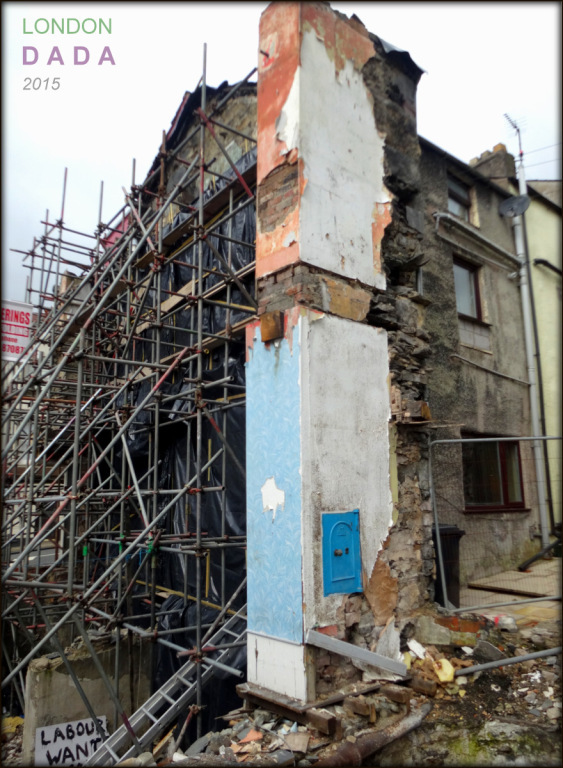 Demolition site, Lambeth. Alluding to presevation of wealth for the select few, symbolized by the “true blue Tory” safe wall safe ( safe from demolition, wealth safe from banking crises etc ), whilst surrounding supporting structure is reduced to zero hours nil rights wreckage, ripe for a new fat cat profit private contract / poverty wage / job insecurity economic model to rise from the ruins like a diseased zombie. Signed edition of 25 fine art Lightjet prints on Kodak Pro Endura. London Dada fast-access archive / works presently released for purchase / investment. 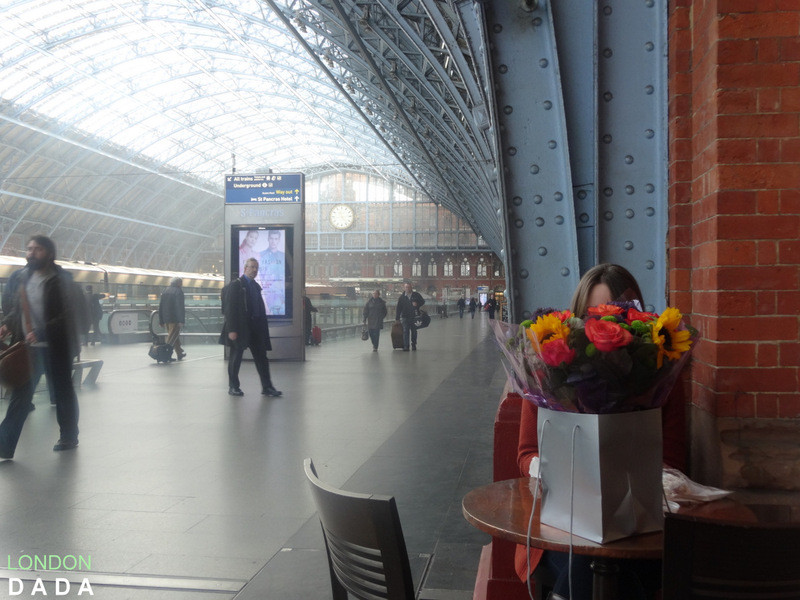 The archetypal girl-on-a-train/ what might have been-but never was. London St. Pancras Eurostar & Mainline station. ” The world of the lonesome guy ” latest.